Last week I was not able to blog because of a trip to St. Augustine, FL. I was sick for most of the week, so there wasn’t much to blog about anyway. Monday: On Monday I went to book club again, before a Wings Way of Adventure check-in. We have to ask a stranger for a coffee date and ask them about their work and life. We decided to meet on Wednesday to discuss this further. I messed around for a few minutes, watched a game that Charlotte learned in Mont-Libre ALC, and took a student-led gymnastics class before school was over. Wednesday: ChangeUp went rather well, I played Iota again, and Amy Steinberg was unable to make it for her scheduled offering. Thursday: After a Mica’s Art without Mica (my brother was sick and she needed to stay home) we walked to Veterans Park. We played games. It was fun. Friday: After book club, we biked to Amelie’s Bakery*. I like that place very much. We just got back. *I did not have time for the accent over the first ‘e’. After a spring break that felt much longer than it actually was, school is back in and we immediately got back on track. Tuesday: After excitedly greeting everyone and getting back into my routine, we started reading a book by @katecake’s father. It’s titled The Legend of Mr. Creepy, and it seemed everyone quite enjoyed it. Immediately after that, I attended a Culture Committee meeting about welcoming the ALC-NYC visitors, which was coincidentally interrupted by their arrival. Once they were acclimated, I worked on Duolingo (while @tessao danced and meowed intensely in the middle of the room) and geometry before Anatomy and Physiology and crossfit. Wednesday: On Wednesday morning, I facilitated ChangeUp. It was a moderately simple task, but extremely enjoyable and tiring at the same time. This was the first ChangeUp that was split into two parts, the second one optional, and it went rather well. I felt like the combination of my being somewhat tired and my lack of any preparation or experience made it slightly difficult, but I was told by several people that they did not notice. After ChangeUp, I went to Writer’s Workshop and practiced Duolingo and geometry while people in the room played Balderdash. Thursday: After an entertainingly unorganized meeting about the Wings group trip to St. Augustine, FL, we went on a ‘hike’ in Uptown Charlotte. We walked to the library, and then to Romare Bearden Park, and stayed there for a while. I fell asleep, and the time I was awake there was still longer than our total walking time. We returned to school and CHARLOTTE WAS BACK FROM CANADA. After we went to crossfit there was a wonderful potluck at Jess’s house. Friday: Today I listened to The Legend of Mr. Creepy again, played a game by @liam, who I now want to meet eventually. That was most of the day. I might not blog next week because the St. Augustine trip leaves Friday morning next week. Choose a subject that you want to learn more about, go to the librarian, and ask for recommendations. This can be something you’ve been studying for a while, or something brand new. Or you can just ask them to recommend the most fascinating book that’s come out recently. 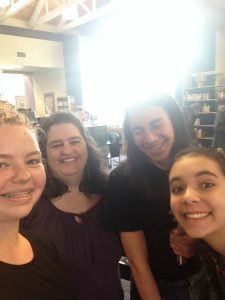 Take a selfie with the librarian and one book that they helped you find and add it to your portfolio (as its own page or blog post). This is a rushed, awkward picture. I could not quite figure out the camera, but we got it and ran out. From left: @alonalearning, our unfortunate victim, myself, and @libby. You must expect a painfully awkward result of a transaction between strangers if said strangers are teenagers and librarians. I am sorry you had to see that. I am blogging on Thursday because I am going to go to the Raptor Center tomorrow. Spring break is next week. Monday: First I listened to the last Bud, not Buddy chapters before the play on Tuesday. Then an assortment of things happened (jumbled together), including @tessao giving me a personality quiz/physical exam just because I had free time, Duolingo, and talking to loud people. Then the Wings group continued Blake Boles’ The Way of Adventure course. We got to an outdoor challenge and decided to do it later. It ended up happening today. Then a meeting about students facilitating ChangeUp. Tuesday: I will try to make the rest of this brief. Decided not to do mystery science, worked on Duolingo until the play. Bud, not Buddy as an Imaginon play was not bad, and it followed the book at least most of the way. Got back in time for clean up, Anatomy and Physiology, and crossfit. Wednesday: The first morning ChangeUp after a decision to move it. After that, Dean had an all day music/art/play event called the Space Jam (Because we’re, like, jamming the space, dude, get it?) Which was exciting for a while until it got rained on. It rained very very heavily. The day was still fun. Thursday: Today I made a plaster hand mold, watched @alobob run around with his arms in his pants running like a chicken, worked on Duolingo, and went to the library to complete the Way of Adventure challenge (more on this in the next post, in about 2 minutes). Then, I started this. All right, On to the next post. School will return Tuesday, April 17th. The website was not working for us temporarily, so this post was typed up On the 31st at around 13:25 and copied into the blog. I have also been very tired this (last) week. Monday: On Monday I listened to Bud, not Buddy again, and managed to stay awake until Reader’s Workshop. After a trip to the park, I did a bit of work and Duolingo and went home feeling very tired. Tuesday: After listening to the book again, I realized I didn’t have the energy to do cooking class, and ate until a meeting with Dean about a surfing trip in June. After the meeting, I went to Writer’s Workshop before getting my geometry and Duolingo done. There was no Anatomy and Physiology class, so I stayed at school until crossfit. Wednesday: My mother came in to make dream catchers with paper plates, beads, and string. It was more well-received than we expected. After that, I did my geometry work until Dean had another meeting about an all-day art/music/play event Wednesday, April 5th. After the meeting, the Wing group continued Blake Boles’ Way of Adventure challenges before Gratitude Circle a very difficult (no further comment) ChangeUp, the events of which unfortunately fell on the new student facilitators, Tessa and Elisha. They did very well for the situation they had to deal with. Thursday: The hike on the Greenway in Charlotte was fun. It was easier and calmer, except when two students managed to top the ‘event’ from Wednesday, but everyone was fine after everything was discussed. I swung and flipped Tessa around at the park, and managed to lift several students on my back and even up on my shoulders. After the hike, I waited at school for a while until crossfit. Friday: Today I listened to the book again, went to my first Culture Committee meeting about what happened on Wednesday, messed around for a bit, did more work on Duolingo, and threw Tessa a bit more. I am typing this now at 13:50 (yes that took twenty-five minutes before editing), aware that the website is currently down. I will be at Mystery Science until 15:30. Next Tuesday (as of posting this has happened) I am going to see the play Bud, not Buddy and Wednesday Dean is having a big event at the park. I will try to keep each day’s paragraph about the same length this time. Monday: On Monday, I listened to Bud, not Buddy again. Then I did a some geometry work for a couple hours, before trying a course on duolingo.com. I really liked it, and I am going to use it for my French practice from now on. I went to Reader’s Workshop and attended a meeting which is apparently training for students to facilitate future ChangeUp meetings. I am looking forward to see how it goes next week. Tuesday: I listened to Bud, not Buddy again before cooking class. We made salsa and guacamole. I worked on Duolingo until Writer’s Workshop, during which I fell asleep until clean up due to my lack of sleep the night before. I still did Anatomy and Physiology and crossfit. Wednesday: My mother came in the morning to offer thumbprint art with acrylic paint. After that, I did more test preparation and more Duolingo. At around 13:40 we left to see a school’s production of The Lion King. It was entertaining and rather impressive. There was not a ChangeUp meeting this week. Thursday: On Thursday I went on a hike to Crowder’s Mountain. It was very fun, yet the obvious danger of stumbling and falling onto a sharp rock (or the cliff, which someone has already done this year) was present in my mind for the later portion of the hike. Going up was strenuous, going down was petrifying, and I thoroughly enjoyed the whole thing. I went to crossfit afterwards and went home physically feeling like a squid in a blender, still happy with everything. Friday: Today book club was cancelled, so I did more geometry work and went to the second ChangeUp facilitation meeting. Not much happened until clean up, after which I started Blake Boles’ online life course and writing this blog. Next week the hike is replaced by a trip to the zoo. I am slightly rushed right now, because this will be rather long. Monday: Not much happened until around 11:00, when I took a preparatory test on geometry. I still do not understand a thing, and I will be learning geometry next week as it is likely my worst subject. Shortly after giving up on that, @tessao and @animalfreak9 again tried to teach me some basic gymnastics maneuvers. Long story short, @katecake tried to teach me a kick-over and I collapsed and badly bruised my knee. I ate lunch with an icepack on my knee and played balderdash until @zelda’s birthday celebration. Tuesday: On Tuesday I attended a reading of Bud, Not Buddy by Christopher Paul Curtis before being driven to @melissamulligan’s house for cooking class. It was very interesting and fun, even though there were some loud, crazy moments. Once I got back, I ate lunch, started labeling jenga blocks, went to Writers Workshop, and finished the blocks. There was no Anatomy and Physiology class, and we had @alonalearning’s birthday celebration at the end of the day. I had to wait at crossfit until 18:00 because of scheduling issues. While waiting, I found myself to be rather decent at the science portion of the preparatory test. Wednesday: In the morning, my mother came in for art and helped everyone make coasters using tiles, Sharpie markers, and rubbing alcohol in pipettes. The scent coming from the room nearly made me want to open a window while it was freezing outside. I went to a meeting about the hike and was disappointed that plans changed. I had lunch and waited until Gratitude Circle and ChangeUp. Thursday: The hike ended up being at Reedy Creek Park. Due to a change of plans, my mother had to drive. It was very cold, though not as cold as I had planned. We played around at the park and returned to school at 14:30 before an… eventful… car ride and crossfit. No further comment on that. Friday: Today I watched a talent show orchestrated by @ayan and was amused and impressed by every act. I had lunch and walked around until clean up and writing this. Spring is starting on Monday, not that the weather corresponds. That was very long and frantic, and I did not add enough emotion and reflection. I am using a day planer book to be able to take on more work and make sure I don’t get dangerously unoccupied. Spring break part 1 is over. Crossfit will return next week. Tuesday: Finally back from break, the whole school quickly began reassimilate. Set the week was refreshing, and it was surprisingly easy to carry on as if the break had never happened. Wings spawn point was just as nice, followed by meetings for book club and the summer road trip. After a slightly less exciting Writers Workshop, I organized some bookshelves and crossed that out of my planner just before cleanup. Wednesday: I had to wake up at 05:30 on Wednesday morning because my brother left for a three-day trip to the Barrier Islands. My mother came in and presented a mandala making/coloring event at 10:00. I organized another bookshelf and organized the yarn in the craft bin. Afterwards, I went to the park and played soccer until Gratitude Circle and ChangeUp. Thursday: Yesterday I went on a very fun urban hike in central Charlotte. It was filled with stops at parks and wasn’t really that much of a hike at all. Notable moments include walking into a lamppost, being a parasol, and @alobob accidentally running into my hand (and being chopped in the process) so hard that he fell flat and I had to make sure my hand was intact. It was exciting and fun throughout. Friday: Today I was not feeling very well, but I managed to have Wings spawn point, go to the supermarket to help get the materials for the cooking class, organize another bookshelf, take a test prep, learn a few basic gymnastics maneuvers from @tessao and @animalfreak9, help some woodworking projects, sharpen a few pencils and write this post. I am still feeling worse than I have for the rest of the week, but considering the amazing week I had, that isn’t saying much. Next week, I will hopefully feel happier. Last week we did not blog because there was no school on Friday and we did not plan ahead. This week we are blogging on Thursday because we were going to have a snow tubing trip tomorrow, but it was cancelled. We will still go on a trip tomorrow anyway. Monday: On Monday I listened to Lemony Snicket’s A Series of Unfortunate Events. I enjoyed it very much. Not a lot happened until the afternoon. After a (rather boring) park visit, we had a school dance in the church’s ballroom, during which… things… occurred. Yes. A few plate-throwing fights and bad song suggestions later, we went back into the school building and went home. Tuesday: Listened to A Series of Unfortunate Events again, and went to a cooking class during which we made no-bake jar cheesecake, which was very very very good. I will definitely make that again at home. Find the recipe on the ALC Mosaic Facebook page if you want it. Afterward, I went to a fun and interesting Writers Workshop before Anatomy & Physiology and crossfit. Wednesday: On Wednesday my mother came in to offer ‘stained glass’ art, which involved glass jars, tissue paper, and Mod-Podge. Just about everyone seemed to like it. Nothing was scheduled for the rest of the day, and I was very stressed/difficult to manage and had to be pulled aside for a conference until just before Gratitude circle and ChangeUp. Thursday: Today I went on a lovely hike at Boyce Park. It was short, but very scenic and fun. We played in the field for a while after the trail and then came back here. In lieu of the snow tubing trip, tomorrow we will go ice skating. I apologize for the slight delay of this post. I am waiting outside to be picked up and it is very cold. Tuesday: We had to fit a few more things into the week because of the day off on Monday. I watched the movie version of Bridge to Terabithia, attended a cooking class, and cleaned up early to go to Anatomy and Physiology before crossfit. Wednesday: On Wednesday my mother came in to offer a meditative drawing class, which went over very well. I attended Writer’s Workshop and @ariana’s birthday celebration before ChangeUp. Thursday: In the morning we went on a hike in Cowpens, SC and learned about the Battle of Cowpens during the Revolutionary War. I enjoyed learning about the double envelopment strategy. After we returned to school, I almost immediately went to crossfit. Friday: Today @ariana’s father Armin came to tell us about his life as a refugee and eventual immigrant in the U.S. escaping the Bosnian War. It was an interesting and powerful story. Not very much else happened today, and now I am here, outside, waiting to be picked up by my father. I am, as always, anxiously looking forward to next week.